On July 8th, the annual 'sanctuary' music festival kicked off in Tokyo's Odaiba. At the festival, Haier's AQUA brand and the 15,000 visitors of the festival participated in online and offline interactive activities. Inject new elements into the festival. It is reported that the 'sanctuary' music festival is a large-scale music festival with dance music and DJ as the main elements. It has become one of the most popular festivals in Japan every July. The sun is hot, but it does not affect the enthusiasm of tourists to participate in the festival. The music festival has six venues. 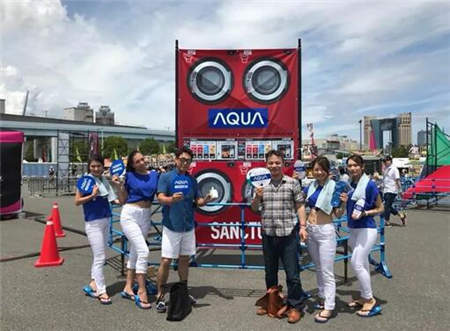 AQUA has set up a giant photographic background board for AQUA commercial wash patterns in popular venues, eye-catching color matching and music festival atmosphere. The pattern attracts a large number of users to take photos and upload social networking sites. In addition to providing a photo background for visitors, AQUA also prepared a customized version of summer slippers for enthusiastic users who uploaded 2 or more AQUA photos on social media. 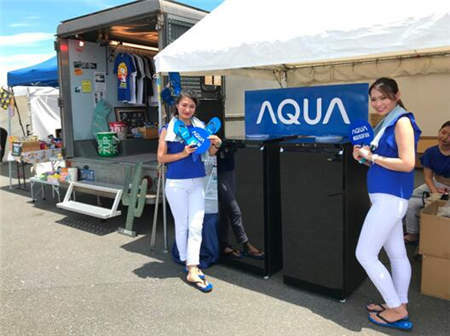 At the same time, all the enthusiastic users at the site received the AQUA special paper fan, and also received free drinks in the AQUA new cool cabinet series. Through a series of interactive experiences, AQUA realized a 'zero distance' dialogue with the music festival visitors, which enhanced AQUA's presence. The popularity and goodwill of the Japanese user community. On the Haier platform, there are not many AQUA interactive experience activities like the music festival. It is based on the community interaction of the user groups, and the market performance continues to deliver satisfactory answers. Since 2012, Haier officially released the new brand 'AQUA' in Japan. Series products, by the first half of 2017, AQUA has laid more than 2,000 stores in Japan. The key channels such as Yodobashi Camera can be seen everywhere. In January-July, AQUA revenues have increased by more than 20%, refrigerators, household washing machines. Commercial washing machines achieved double-digit growth, and refrigerators achieved 121% year-on-year growth. AQUA's innovation comes from user needs and pain points. Taking the washing machine as an example, on the AQUA care platform, users can conveniently reserve idle machines online, receive text messages to pick up clothes, and monitor the washing process at any time. IoT wisdom The washing platform realizes the visualization of the washing information. The user can know the washing process in real time through the mobile phone while shopping. The laundry owner can not only obtain the hardware machine from AQUA, but also get a series of value-added services. The owner can use the IoT Internet of Things. To realize the management of business data in the background, remotely monitor the operation status of the store, promptly eliminate faults, and carry out promotional activities in a timely manner to facilitate the expansion of the store. The data shows that in 2017, the AQUA brand has a market share of 75% in the commercial community washing machine sector in Japan, becoming the most popular high-end brand in the region. Currently, AQUA Community Wash is copying this model to overseas regions outside Japan, including Thailand. , South Korea, China and other countries and regions. At the same time, it has continuously upgraded settlement methods, derivative service projects, and cooperated with large supermarkets in Japan to build cross-border ecological platforms and improve ecological income.